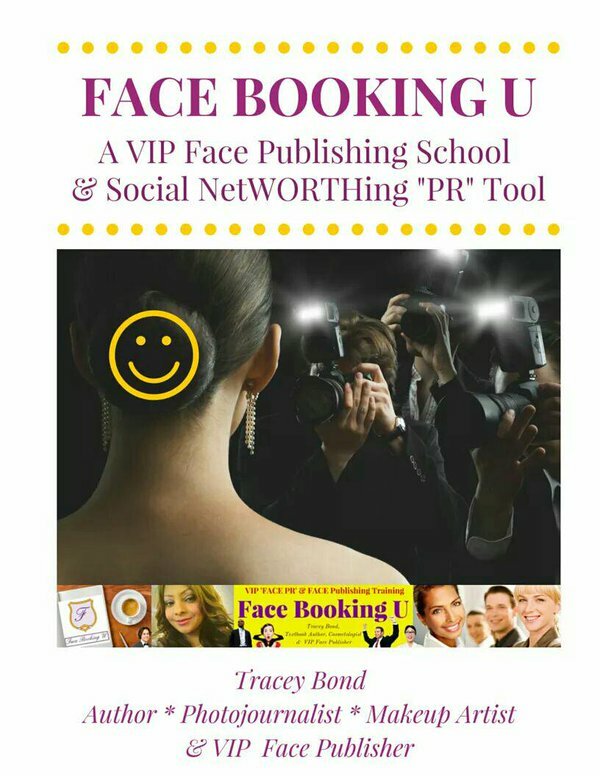 Face Booking U Coursebook | Face (PR) Public Relations Training | VIP Makeup Artistry – Welcome to FaceBookingU.com & FACEPR.org : "Founder of the new PR niche industry "FACE PR!" Mission: “If you’re serious about seeking self-improvement VIP Social Net WORTHing (tm) Success? If you want to ensure that your best FBU * PR’ressed face gets booked somewhere that matters to (personal, professional and public) the viewer and reviewer? If you feel your face has been lost in the attentive-preference jungle of the social crowd…well then your ‘on-booked’ face is way overdue! Tracey Bond is a collegiate family literacy instructor with multi award-winning entrepreneurial accomplishments as a social media certified professional, author, publisher, front-page newspaper education columnist, reporter, cosmetologist-esthetician and speaker who has been recognized & merit-honored by her’s countries highest level of governmental authorities from (retired) Local Mayor, Illinois State Governor at The Governor’s Mansion, 2 USA Presidents & 1 Retired USA Army General…et als.